Ontraport Review: They're a Popular Tool, But Does That Mean They're Good? I first heard about Ontraport a few years ago from some friends at Mindvalley. According to a testimonial by their founder Vishen, Mindvalley’s COO spent six months comparing delivery rates, open rates, and the general performance of Ontraport against all of their major competitors, and Ontraport came out on top. Since then, the marketing automation landscape has changed significantly. While Ontraport were once among the most affordable marketing automation providers for small businesses and information product marketers, there’s now ActiveCampaign on the block – which starts at a ninth of the cost of Ontraport. Is Ontraport a good product? Of course. Is it worth 9X more than ActiveCampaign? That depends. In this review, I’ll explore the pros and cons of Ontraport in the context of how it stacks up against its competitors. Let’s start with Ontraport’s strengths. Among the most affordable marketing automation system – When I originally wrote this post, this point said ‘the most affordable’. As mentioned, Ontraport has lost its position as being the most affordable solution, but it’s still quite reasonably priced when compared against Infusionsoft, who charge a mandatory $999 – $2,999 kickstart fee, and is priced a little bit higher. If budget is a concern, though, ActiveCampaign is going to be hard to beat. Visual campaign builder – In 2017, Ontraport announced Ontraport 5, which was one of the biggest upgrades to their platform since the original launch. At the centre of this upgrade was Ontraport’s new visual campaign builder. While the new dashboard does look great, it’d be remiss not to point out that some of Ontraport’s competitors had built similar visual dashboards several years earlier. Highly scalable & less price creep than competitors – One of the most common criticisms of marketing automation tools is their price creep. Going from 1,000 contacts to 10,000 contacts on Hubspot, for example, will increase your monthly fee from $800/month to $2,400/month. With Ontraport, the fees for adding extra users, contacts, and email credits are significantly less than some of their competitors, which makes it easier and more affordable to grow your list size and automation sequences. What’s also particularly nice about Ontraport’s pricing is that you only need to pay for what you need. Instead of having to upgrade to the next tier, you can just pay an extra $99/month for 100,000 extra email credits, or $47/month for an extra user. A huge range of good features – With Ontraport, you get a CRM, shopping cart, affiliate management tool, landing page/micro site creator, auto-responders, a WordPress membership platform, online event/webinar creator, and task automation for a few hundred dollars per month. 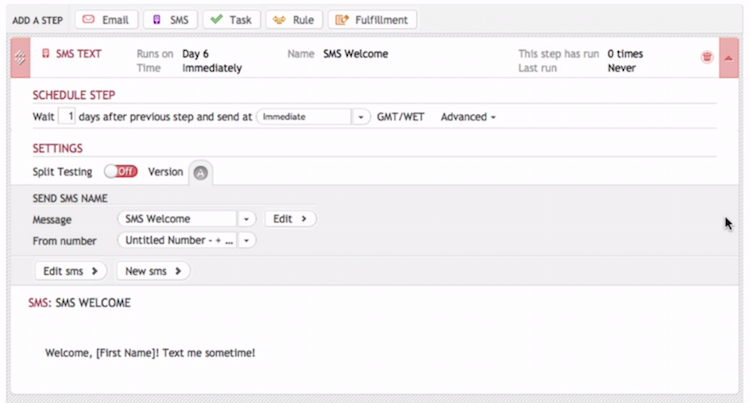 To get this level of functionality in Infusionsoft, you’d need to buy quite a few add-ons. Usually, when a company offers a list of features like this, you might suspect that some of them are just going to be bells and whistles. This isn’t the case with Ontraport – all of their features are actually quite good. What’s also particularly nice is that, unlike Infusionsoft and Hubspot who ‘unlock’ more features as upgrade your plan, you get access to the whole suite of Ontraport features, whether you’re on their pro or team plan. True multi-channel marketing – One of my favourite aspects of Ontraport is the ability to automate sequences across multiple marketing channels. You can, for instance, communicate with leads via 2-way text message, or even by posting them a postcard. This ability to communicate not only across social platforms and via email, but also outside of the online world is a huge selling point for Ontraport, as it gives companies an opportunity to stand out from the crowd and reach leads/customers where there’s less noise to compete with. Great email delivery rates – Ontraport have their own dedicated IP addresses for sending emails, which have very high sender reputations, enabling you to avoid the spam box and get great email delivery rates. Highly-segmented reporting – With Ontraport, everything is tracked using UTM variables, making it easy for you to know your CPA, customer lifetime value, and which lead sources or content campaigns are generating the best ROI. Great customer support – While I don’t have any first-hand experience with Ontraport’s customer support, it’s evident from the hundreds of positive reviews that their support team are both technically knowledgeable and helpful in educating customers. On top of their standard support, Ontraport run their own annual conference and have a good amount of educational content to ensure that customers get the most out of their software. Mobile apps – At the 2014 Ontrapalooza (Ontraport’s annual conference), Ontraport announced the launch of both an iPhone and Android app that allows you to manage your CRM, add new contacts, and subscribe users to your sequences. While you can’t review reports or do anything too in-depth, the apps are useful for keeping your contacts up to date and sending quick messages (either via email or text) to different groups. Powerful shopping cart features – From automated credit card payment collections to upsells and pre-made sequences designed to reduce money lost from abandoned cart payments, the Ontraport shopping cart has a lot of powerful features to reduce friction and boost conversion rates. Not the most inspiring dashboard – While it is completely customisable, the Ontraport dashboard isn’t particularly inspiring or visually intuitive. 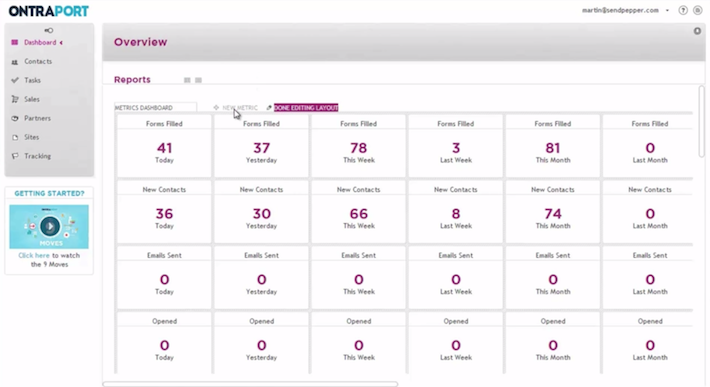 As shown below, the main dashboard displays a table of boxes that show whatever metrics are most important to you. Steep learning curve – It can take weeks and months to fully understand what you can do in Ontraport. While their software does have a steep learning curve, it’s good to remember that this is the case with all marketing automation tools. The impact that Ontraport can have on growing a business almost certainly makes the steep learning curve worth the effort, but there are areas where I think Ontraport could make the software a little bit easier to learn. Not many integrations – While Ontraport do have an API and 24 partner integrations, their infrastructure for third-party apps is nowhere near as extensive as Infusionsoft, who at the time of writing have 348 apps and integrations in their marketplace. Ontraport’s integrations include most of the common services, like Quickbooks, WordPress, PayPal, 1ShoppingCart, and LeadPages. But with only 24 integrations you’re obviously a little bit limited unless your developers are able to play around with the API. Duplicate records – Ontraport doesn’t make it easy to clean up your records and remove duplicate contacts. If one user downloads an eBook from your site, attends a webinar, and buys a product, they can end up being added to your database three times. While this wouldn’t be an issue if Ontraport had an easy way to remove duplicates, they don’t. In Summary: Who is Ontraport best for? If you sell information products, run a membership site, or have any kind of online training or education company, Ontraport is a strong contender for a good marketing automation tool for you. While ActiveCampaign is definitely worth looking at, Ontraport does specialise in this area a bit more and has more of a community feel of entrepreneurs with their events and conferences. Ontraport don’t have a free trial, unfortunately, but they do have a free demo that you can sign up for here. They also have a 90-day money back guarantee (with no setup or cancellation costs), so worst case scenario you can always cancel your account within the first three months and get your money back. Old… Ontraport 5 is out. While Infusionsoft hasn’t changed that much.